juni 2013 | 420 blz. This book contains the Principles of European Family Law regarding Property Relations between Spouses. In these Principles, the CEFL has developed an all-inclusive set of rules for two matrimonial property regimes: the participation in acquisitions and the community of acquisitions. maart 2007 | 323 blz. In these Principles, the CEFL has developed a comprehensive and original set of rules in the field of parental responsibilities based on respect for the rights of the child, non-discrimination and, as far as possible, self-determination. In their provisions on specific issues the Principles opt for solutions which seem to be workable and shall avoid unnecessary hardship and disputes. november 2004 | 170 blz. The CEFL presents its first Principles of European Family Law in the field of divorce and maintenance between former spouses. 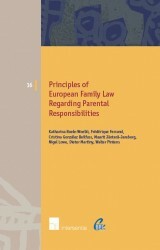 The Principles aim to bestow the most suitable means for the harmonisation of family laws in Europe. In this respect they may serve as a frame of reference for national, European and international legislatures alike.